someone is about to get new levels of fired. "how was I supposed to know what na pas fumer meant?" Click on the date for the whole thread. So far the fire seems to have been started by a team of Muslim Satanists led by Steve Bannon. An electrician may have also been involved. i can't believe it. what a horrible loss. when people ask me why we take my kids on big vacations, i'll use our trip to paris 2 years ago as anecdotal reasons. they got to see notre dame for themselves. did you let them have pigeons sit on their heads and arms outside? You would assume a cathedral that old would be mostly stone. How did the spire burn and fall? the roof is all wood. plus there's a lot of stuff inside that is wood as well. that scaffolding i'm sure didn't help either. That's what I was hoping for. Judging by what I'm just seeing in images, it appears that while the interior was gutted, and that alone is a terrible thing, this could have been far worse. 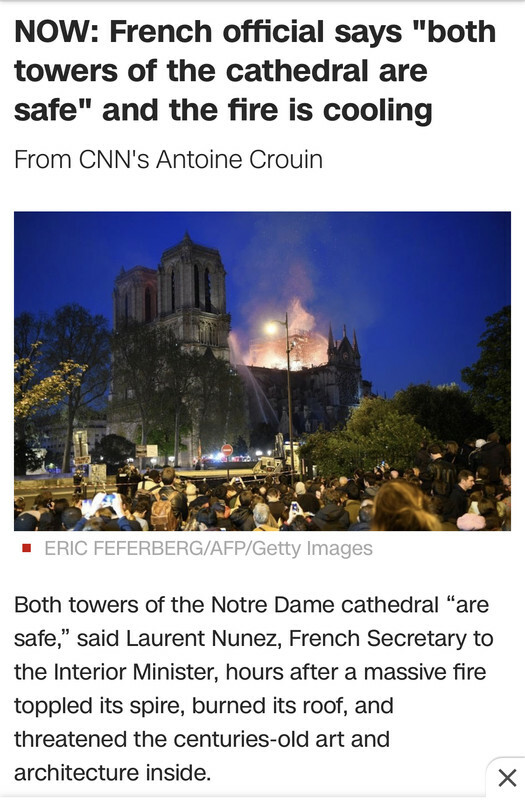 hopefully they saved most of the works of art and religious relics.